Dental care is always an important part of our overall health, no matter how old or young we may be. As we age, a variety of factors make the task of keeping our mouths healthy more challenging. It’s essential to remember that because of the link between oral health and overall body health, even if many factors are fighting against us, we must make every effort to care for our teeth and gums. We believe that by helping patients become aware of some of these issues that work against us, they’ll be more inclined to see a dentist regularly. In our blog today we’ve outlined several reasons why senior dental care can be difficult, and some important signs to look out for in yourself or your loved ones. Dry Mouth – To help fight other health issues as we age, we tend to take more medications. One of the most common side effects of these medications is dry mouth, which can lead to tooth decay when the saliva can no longer protect the teeth. To combat these issues we recommend a line of dry mouth product options from Biotene, such as their oral rinse, moisturizing gel, or other great products. 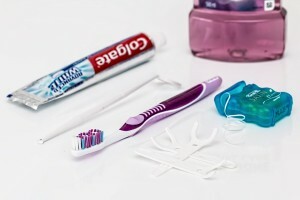 Gum Disease – Certain health issues like cancer or diabetes, as well as other issues like ill-fitting dentures or bridges can contribute to gum disease. Gum disease can lead to a variety of oral problems, including sensitive teeth, receding gums, and missing teeth. All of these factors can compound and create their own health problems (as you’ll see below). Heart Disease – The American Academy of Periodontology says that people who suffer from periodontal disease are twice as likely to have heart disease or coronary artery disease. This is concerning for seniors, as research from the Centers for Disease Control & Prevention has led to an estimate that nearly 2/3 of adults over 65 have a moderate to severe form of periodontal disease! Jaw Movement – If you’ve had teeth pulled or you’ve lost some along the way, we strongly encourage dental implants. When these gaps in our smile aren’t filled, the remaining teeth shift to fill in the space. This can lead to numerous bite issues that can easily be avoided. Pneumonia – A study at Yale University, coupled with dozens of other studies, has suggested a link between poor oral health and pneumonia in older adults. As we age, it becomes more difficult to recover from these serious health concerns, so any way to combat these situations is beneficial to our well-being. Stained or Yellow Teeth – Underneath the tooth enamel is a bone-like tissue referred to as dentin. As we age, the dentin begins to show through the outer enamel layer from the foods and drinks we consume. Combine that with staining from drinking coffees and teas or from smoking and your teeth can slowly start to darken. The only way to keep your teeth their whitest is through regular dental checkups. Stomatitis – This term refers to any inflammation of the mouth or lips. It’s always uncomfortable, and it can have many causes. In seniors, two common causes of stomatitis are dentures that aren’t properly fitted and poor oral hygiene, which leads to the tissue underneath the dentures becoming inflamed. As you can see, keeping up with your oral health as you age is vital to your overall health. So remember to brush twice a day, floss regularly, clean your dentures daily, and don’t forget regular check-ups at the dental office. If you’d like to learn more ways to take better care of your mouth as you age, or would like to schedule an appointment with the team here at Susquehanna Dental Arts, give us a call at 717-684-3943. Posted in Informational and tagged biotene, dental care, Dental Implants, dry mouth, Gum Disease, heart disease, jaw movement, oral health, pneumonia, stained teeth, stomatitis on July 20, 2016 by admin.